As you may recall, I recently purchased a Steelseries Rival 310 optical mouse. That purchase really started me down the path of caring a lot more about my computer peripherals like mice, keyboards, and even mousepads. 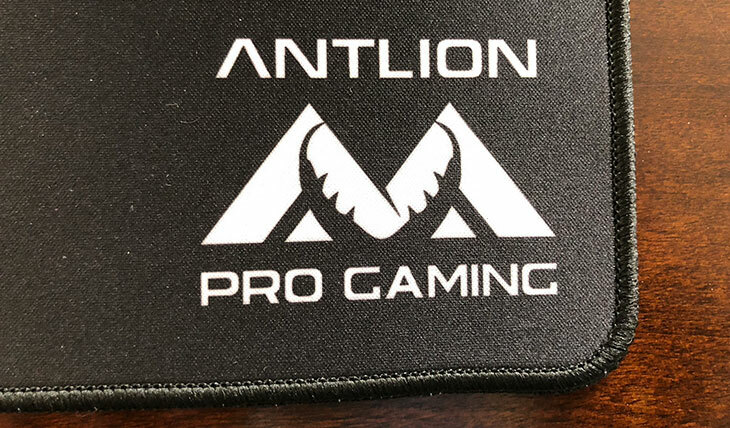 Antlion was awesome and sent me their Antlion Pro Gaming Uber-Wide Mousepad to review and show to you guys. I'm not being paid or compensated for this review, but I did receive the mousepad for free. As always, I'm using that as an opportunity to share with you guys my thoughts. This thing is massive, coming in at 3x1 feet. The point behind using a mousepad like this is to create a larger surface area to move your mouse around on, which helps in FPS games and other games where you use wide mouse movements with precision mouse tracking. I'm still a novice at the whole mouse sensitivity meta game, but let me tell you what stands out to me. 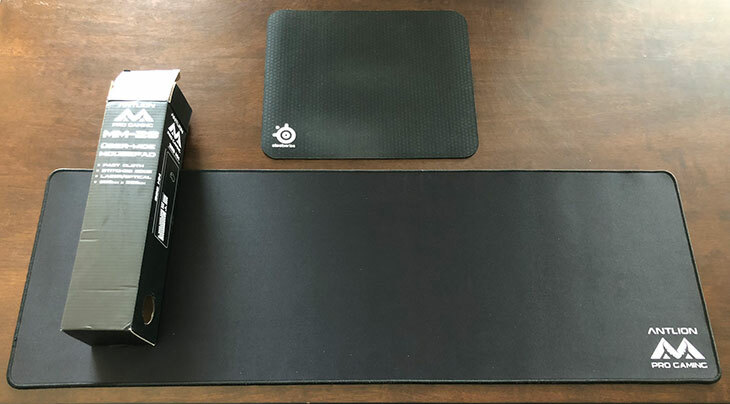 Most of my experience will be compared to an aluminum mousepad, and more recently a cloth mousepad made by Steelseries. The surface of the Antlion Uber-Wide Mousepad has a very smooth feel to it. They call it "fast cloth", and I assume that's because the mouse glides over it with ease. For whatever reason, my wrists have really sensitive skin that gets irritated on abrasive materials. My Steelseries mousepad was fairly rough on my wrist, but this is really smooth and comfy. It's still definitely textured -- perhaps more than some of those "frictionless" mousepads -- but feels smoother than a QcK from Steelseries. The edges are stitched to eliminate warping and fraying which can definitely happen with cloth mousepads. In terms of overall usability, I've been using it all day for normal computer work as well as some gaming in Battlefront 2, and I haven't noticed any issues at all. In fact, at one point I realized my mouse movements felt smoother than normal. Compared to my aluminum mousepad, it's night and day different. My aluminum mousepad from Razer would not work with my optical mouse at all. My one complaint has to do with my keyboard sitting on top of the mousepad. For whatever reason, I guess I move my keyboard around a lot. When I went to move my keyboard and it didn't budget because the mousepad holds it firmly in place, it was a little jarring. That's in no way a critique of the mousepad, merely my habits and the need to be aware that this mousepad will take up most of your desk. Overall, it's on-par with what you'll get from a Steelseries type mousepad but for half the price. If you've ever thought about getting a bigger and potentially more accurate mousepad, and want one that works well with optical mice, it's definitely worth checking out. 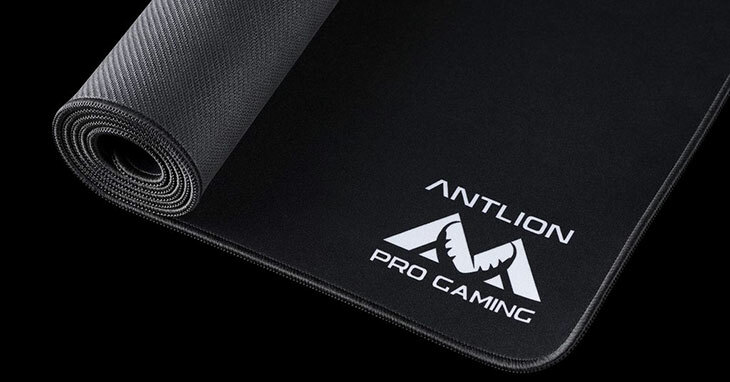 The Antlion Pro Gaming Uber-Wide Mousepad will set you back $20 on Antlion's website, and probably similar on Amazon when it's released and in stock. Do the stitched edges rub against your skin in an uncomfortable way? The stitching is soft as well, and I haven’t had any issues so far. The stitching is only barely raised above the surface.